This weekend the series travels down to Albany for Round Six of the Ultimo Constructions West Coast Series, proudly presented by Elite Mining and Transport Services. 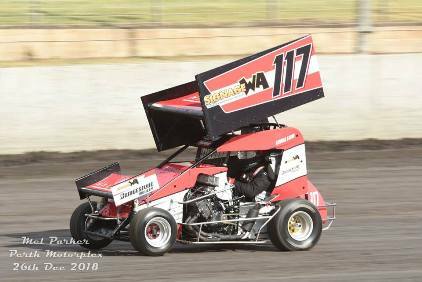 Nine cars have nominated for the show, with current series leader Chris Dymock looking to all but lock in a Series win this weekend with a feature victory at the Albany venue. Coming into this round Dymock has 522 points, some forty-two points ahead of his nearest rival, and considering he has a couple of wins under his belt in the Series already so far, will be the one to beat on Saturday night. Second in the Series is George Eaton, who has impressed with his performances at each of the West Coast shows this season, garnering himself a couple of podium finishes along the way. He is currently the only driver within reach of Dymock at this stage and will be looking to grab another consistent finish. Former WA Champion Thomas Davies has also entered for this weekend, and despite not contesting each round of the series thus far has shown he is still a threat each time he shows up. He grabbed a win in Round Three and currently sits in fifth place overall in the Series, something he will be looking to improve on, especially considering current third place Cody Turacchio and fourth placed Ryan Higgs are not in the field for this event. 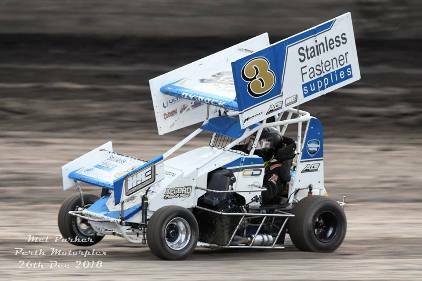 Shane Andersson has been struggling with mechanical issues that have cost him the chance at some good results, but he will be hoping to put all that behind him this weekend and convert his speed into a strong result come feature time. Jacob Priest and Ted Street have been enjoying their first season of racing with some consistent finishes while fellow rookie Amy Waldron has also contested a couple of shows and has started to get a handle on her #23 machine. Ben Stockdale was fourteenth at the State Title and his results through the West Coast Series have been improving so he will be looking for a good run on Saturday while Matthew Edwards-Pope will be hoping to bounce back from bone crunching contact with the front straight wall at the WA Title that saw him miss the last show. This will also be the second last chance this season for drivers to play their Ace Card. This is to be declared at the Drivers Meeting, and allows racers to double their points for the show. This can have real ramifications for the overall Series standings! Racing begins on Saturday night from 6.00pm, with hot laps prior to the event starting about 5.30pm.